Better, in the sense that I'm making real progress on the revisions for Dragon Hunter. Not so much in the sense that I picked up germs from one (or more) of the snotty little rugrats at our Girl Scout event last night. Every time I'm exposed to strange unfamiliar little kids, I seem to get whatever's going around. So despite the event's extraordinary success, I'm paying the price for it today with fever, chills, aches, and other lovely flu-like symptoms. Despite the sickitude, the event was a lot of fun. It was a Mardi Gras themed father-daughter dance. I have to say, it's adorable watching a bunch of little girls slow-dance with their daddies. All the standing on their dad's feet while they hobble around the room, so cute! The funniest thing was watching all the little girls teach their dads such things as the Cha Cha Slide and the Macarena, and dads finally getting into it only when YMCA came on. All the kids seem to know the dance moves, but all the dads managed YMCA, at least. I think they were relieved to finally hear a song they already knew how to participate in correctly. 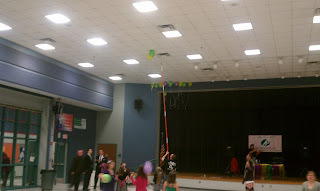 Another bit of amusement: after the dance, we were cleaning up the room, and couldn't figure out how to capture all the escaped balloons that clung to the ceiling in one corner of the room. The school's custodian had the solution. He had a huge long pole with a knife taped to one end of it. The poor balloons saw that pointy stick coming their way and cowered together above the stage. They found no safety in numbers. The balloon popping game was one of the most entertaining parts of the night. It's amazing, because two weekends ago I camped with a kid who had a bad case of strep throat, and came home fine. Last weekend I spent hours at a cookie booth sale in the freezing cold damp wind with tons of strangers, and came home fine. I figured I was immune to the current round of raging infectious blergs, but I was clearly wrong. I'm not feeling very well, so I went looking for a photo that would make me smile. 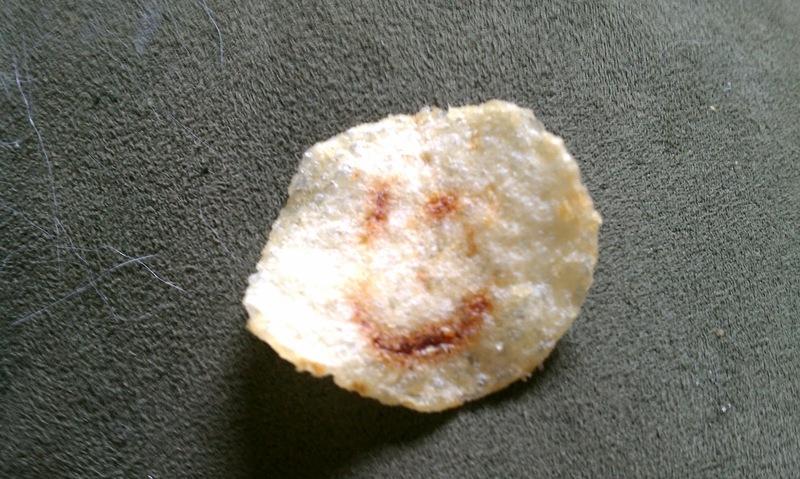 How about a happy potato chip? So since I can't do anything else but sit here on my tuchus feeling icky, I've got no excuse for leaving my ms unrevised. And now I hope my head is clear enough to actually do the work. We'll see. It was clear enough to write this blog, so hopefully I'll manage the "real" writing just as well. Then again, I did include a picture of a smiling potato chip. WTF? We're getting to the part of the story where the agent had a lot more advice for me, so I hope I'm lucid enough to implement her suggestions in a coherent way. It remains to be seen. As for everything else I'm supposed to be doing, it can all wait until I'm well enough to cross the room without stopping for a nap. As long as I'm sitting down, I think I can manage. Let's test that theory. To the word mines!